Extreme Precision Meets Unbeatable Reliability. 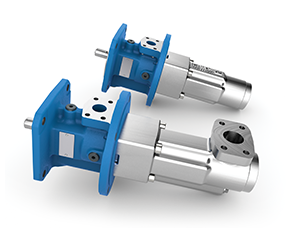 EMTEC-C three-screw pumps excel at moving chips and particles away from cutting surfaces both precisely and efficiently. And with its incredibly durable construction, it&apos;s a level of performance that will stand up to even the harshest environments. The Coolant Pump You&apos;ve Been Waiting For. Drawing from our unmatched industry experience, we&apos;ve completely redesigned the EMTEC-C pump to better meet the unique demands of high-pressure machine tool applications. The new EMTEC-C features breakthrough innovations like a special hardening technique that adds elasticity to metals, eliminating the danger of bore surface fractures and an easy-to-assemble and disassemble design that significantly reduces maintenance times. The Right Size. The Right Angle. Available in different sizes and spindle pitch angles and able to accommodate multiple cooling lubricants at a wide flow range, the adaptable EMTEC-C is sure to be the right fit for your system&apos;s needs. And with our exchange kits, the EMTEC-C easily works with other pumps in your systems. with the discharge connection above the tank cover. and costs compared to dry installation. A Better Pump from Head to Toe. From its hardened rotors and patented reversed hanging idler system to its unique transparent backflow pipe, the EMTEC-C has scores of features that make a huge difference in both the longevity and the performance of the pump. Improved durability. Better reliability. And a level of efficiency that&apos;s best in its class. 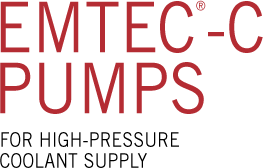 The EMTEC-C three-screw pump is redesigned to change the way you look at coolant pumps.